The Biomat makes a valuable addition to your practice, spa, or gym. The Biomat can be used to prepare your client for therapeutic services, or you may opt to practice your work on the Biomat for an accentuated healing experience. 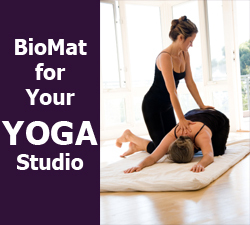 It's ideal for practitioners doing body work because the Biomat adds so much value. Some practitioners opt to charge for Biomat sessions solo, while others incorporate it into their healing work and combine the two. It can serve as an additional stream of income for your practice, both from charging more for your session, and by selling the Biomat to others if you would like to become a distributor. Clients receive not only the wonderful benefits of your healing work, but also the powerful work of Far Infrared, Amethyst Crystal, and Negative Ions. Soon the standard will be, "Are you doing your work on a Biomat?" Be a pioneer in the health field and incorporate this amazing healing tool. Which health professionals benefit from using the Biomat? Massage therapists, chiropractors, physical therapists, spa technicians, rolfers, acupuncturists, energy workers, reiki practitioners, personal trainers, yoga instructors, pain specialists, hypnotherapists, psychotherapists, nutritionists, alternative cancer specialists and any other kind of body work oriented wellness practice. How does it feel to be on an amethyst filled infrared bed? Most clients feel extremely relaxed and experience a relief from long term aches and pains. They also report heightened awareness and clarity of mind, freedom from stress and tension, and increased energy. "Wow, I feel amazing" is commonly heard coming off the Biomat. It is remarkably comfortable, and its warm heating function makes it very enjoyable to receive a healing treatment on. Is it best to put the client on the mat before exercise or treatment? Yes, the far infrared heat is very effective at warming up the major muscle groups and releasing tensions. This makes it perfect for preparing the body for deep bodywork, adjustments, and exercise. It is also possible to do your treatment on the Biomat on the lower green settings. The Biomat Professional perfectly fits onto a massage table. Are the temperature settings adjustable? Yes, you can adjust the heat between gentle and subtle to a deep sauna heat by the use of the controller. Most sessions are done on the buttons ranging from 35C degrees to 45C degrees. For deeper detoxification sessions, such as in spa treatments, or for severe pain, you may want to increase the temperature into the orange, which goes up to 60C degrees. The highest setting creates a sauna effect which produces a very deep and therapeutic sweat, which is helpful in weight loss and heavy metal detoxification. How long should a session on the Biomat last? On the lower settings, people can safely lie on the mat for up to several hours, but if you are doing a higher temperature treatment, limit it to one hour. Always start the client on the lower green settings for a session or two before starting them on higher temperatures because it can be too dramatically detoxifying to start off on the higher temperatures. Amethyst has been found in research to be more effective than other gemstones in projecting the far infrared rays deeper into the body, so the benefits are more far reaching. Amethyst also produces its own Far Infrared Rays. These rays revitalize the biological function of your cells to relieve neuralgia, backaches, and arthritis. Amethyst has been deemed as "nature's tranquilizer" by many health practitioners because of its effectiveness in relaxing not only the mind, but also the nervous system. The Amethyst Effect was scientifically demonstrated through spectral analysis demonstrating a change in Infrared light when refracted through amethyst crystals. Scientists experimented passing (FIR) through a variety of substances, including various gems, glasses, and plastics. Amethyst was found to be the only substance which clearly changed the spectrum of Infrared light. Wave forms mimicked patterns similar to the human voice, according to scientists. While no theory has been proposed regarding the Amethyst Effect, scientists hypothesize that infrared light which is passed through the amethyst releases over 20 million years of information which is made available to the human body for healing purposes. The field of Far Infrared Crystallography explains this effect in further detail . Far Infrared Rays refracted through amethyst crystals organize the (FIR) into geometrical patterns with higher bio-compatibility. In addition to the increased revenue potential of integrating the Biomat into your session packages, you also have the opportunity to become a distributor and make additional commissions off the sale of the Bio mat to those who prefer to enjoy its benefits at home. Springvale Health is committed to helping you get set up as you integrate the Biomat into your practice. We have numerous marketing materials and info packets for you to share with your clients, and should you decide to become a distributor of the Biomat, we will help you get started with the business as well. We offer a $100 discount for the Biomat Professional and Biomat Professional Set for every purchase on presentation of your practice license or certificate.